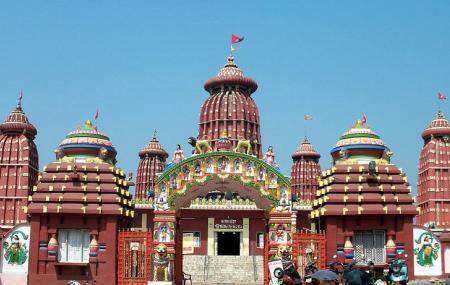 Located in the heart of Bhubaneswar, the Ram Mandir boasts of its ochre coloured idols of Lord Shiva, Hanuman and other Gods made of Marble. The main highlight, which attracts thousands of devotees, is however, the images of Lord Rama, Sita and Lord Laxmana. The towering and carved spires and the fiery terracotta coloured exterior of the Ram Mandir is quite distinctive and it is seen even from far away in the city. The festivals like Rama Navami, Dussehra, Janmashtami, Vivaha Panchami, Pana Sankranti, Shivaratri are peak seasons of the temple and during these times people from all over the world come to experience the grandeur. The marble floored inner sanctum of the temple is used for meditation when there is not much crowd. How popular is Ram Mandir? People normally club together Isckon Temple and Orissa Modern Art Gallery while planning their visit to Ram Mandir.